Cat lovers can all agree cats sometimes engage in odd behaviors. One that cat owners find especially strange is some cats' fixation on plastic bags that lead people to wonder, why does my cat eat plastic? Is My Cat Eating Plastic? If you have a cat that is fascinated by plastic, your first step is to observe what precisely your cat is doing. Some cats merely lick plastic, usually plastic food bags, and may even nibble on them without eating them. Other cats will actually chew and eat the plastic. Another set of kitties do neither but use plastic bags as a source of fun for batting at, chasing and jumping in and out. You'll need to see which your cat is doing to track down the reason for the behavior. Why Do Cats Chew and Eat Plastic? There are a number of reasons why your cat may be chewing and even ingesting plastic. Usually this occurs with plastic store bags, but cats will also do it with any kind of plastic bag such as sandwich and storage bags, food wrappers, and plastic items like cups, cutlery, and containers. Your veterinarian can perform tests to help you determine what is causing the pica. If it's a medical issue, they will work to treat the disease, whereas if they determine it's behavioral, such as OCD, they may prescribe medication such as fluoxetine and clomipramine. Pica also appears to have a genetic component with some breeds being more likely to have it, such as Siamese, Burmese, Oriental, and Tonkinese cats. Cats may gravitate towards playing with, chewing, and eating plastic bags because they don't have enough mental and physical enrichment in their lives. Cats that are anxious may also do this because the activity makes them feel calmer. They may just be using plastic bag or other plastic items because people tend to have a lot of plastic items around the house. If you've taken your cat for a medical check-up and the veterinarian determines there are no medical or serious behavior concerns, try increasing your cat's opportunities for stimulation. This can include foraging toys, cat grass, installing cat trees and perches, and playing more with your cat with interactive toys. You should also be extra vigilant about removing any access your cat has to plastic items. Another understandable reason cats may lick and even chew plastic items is that these often contain residue from foods. If you bring home your groceries in plastic bags or use a plastic storage bin for food, even when they're empty, a cat's sensitive sense of smell will pick up the scent of food. Another reason, oddly enough, is that many plastic bags are made with corn starch or coated with substances like lanolin oil, and this can attract a cat's nose and taste buds. In this case, as with bored cats, be careful about removing your cat's ability to get a hold of any plastic items and promptly dispose of plastic grocery bags or put them away in a cupboard if you recycle them. Another food-related reason cats may lick or eat plastic is a deficiency in their diet. Cats lacking nutrients or other ingredients such as fiber may eat all sorts of weird things, such as their kitty litter or household plants. You can discuss your cat's diet with your veterinarian and try different food formulations and possibly some supplements to improve your cat's nutritional needs. Cats, especially kittens and younger, active cats, enjoy exploring their environment. They may just find playing with a plastic bag fun and licking and chewing may be part of that play time. Cats like the noises that bags make and the way a bag moves can excite a cat's prey drive, just as a shiny, crinkly cat toy would. Despite all the YouTube videos you'll see of cats having fun playing with bags, letting them play with plastic bags is a serious choking and suffocation hazard. 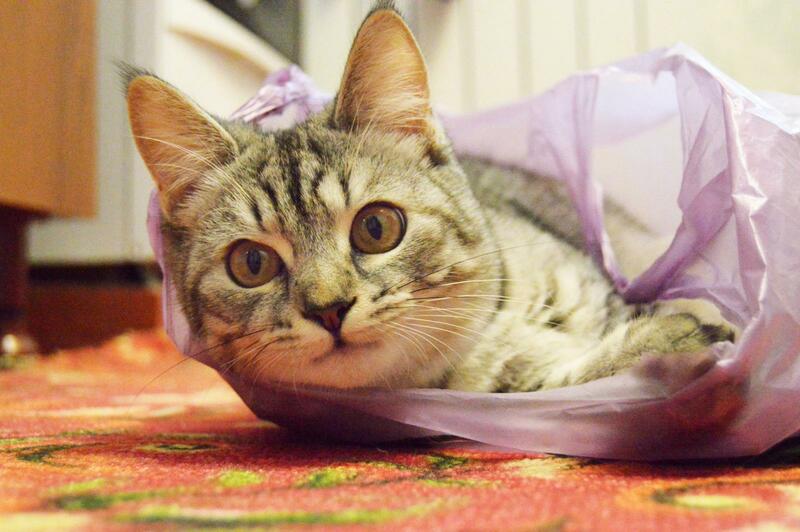 Make sure you don't leave plastic bags and items lying around and give your cat safer items to play with. Why Do Cats Eat Plastic? If your cat starts licking, chewing, or eating plastic items in your home, a trip to the veterinarian is in order to make sure there is no medical or dietary reason for this behavior. If it's purely boredom, work on providing your cat with more things to do to keep him mentally and physically occupied and healthy.